For CTO David Reilly, there was an obvious goal: Standardize on more efficient infrastructure. For a company that spends $3 billion on technology each year – nearly double the amount it did five years earlier – any reduced expenditures translate directly to improved bottom line profitability for the bank. Transitioning to a shared virtualized computing platform not only drove savings in the IT organization, but net profit for the bank. But soon Reilly realized that standardizing and virtualizing was not enough. He wanted to start all over again. Reilly liked the idea. But just ripping and replacing was not an option. 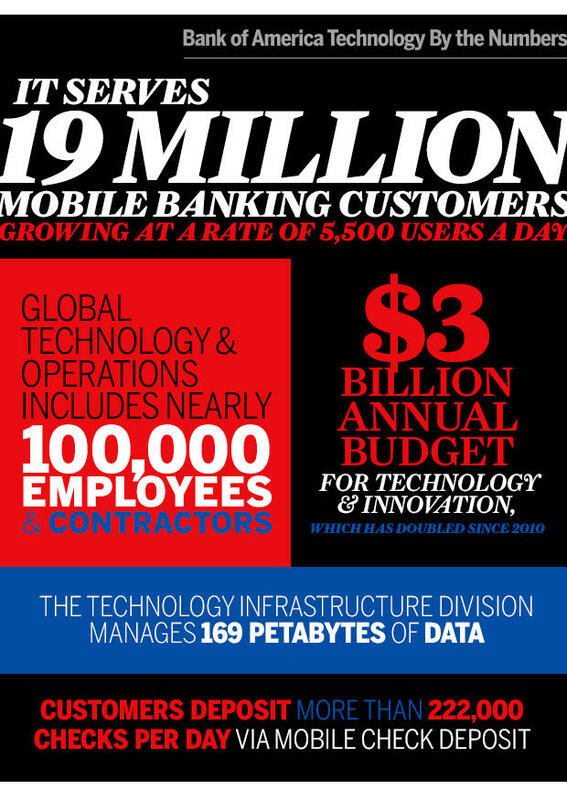 Bank of America has 10,000 technology workers and contractors and 19 million mobile banking customers – growing at 5,500 per day. Reilly’s technology infrastructure team manages 169 petabytes of data. The legacy system couldn’t just be shut down. Eight lines of business within Bank of America are already using the new platform or have plans to migrate including wholesale banking, development and quality assurance. Grid-based workloads are planned to migrate while pockets of the wealth management division will have use cases for it. Workers aren’t judged based on the number of boxes they manage, or how virtualized an environment is. “’How am I delivering against the goals of the firm, how am I managing risk, and how am I contributing to overall profitability?” are questions he encourages workers to consider now. We actually have to get to a point where we could almost completely discard (our infrastructure) and move to a brand new, greenfield environment, unencumbered by any of the history or legacy of our existing footprint. Pulling out the team that worked on the greenfield project as a separate entity was one key to success. Gartner has encouraged this bi-modal IT approach of dedicating a team to work on a new project while still ‘keeping the lights on’ for the rest of the organization. Reilly said it took about a year to get everyone on the same page. The project would not have been possible without Reilly’s bosses – Chief Operations and Technology Officer Catherine Bessant and CEO Brian Moynihan - embracing a long-term, five-year strategic planning initiative. At a recent all-company meeting Moynihan cited the technology infrastructure group as an instructive example of simplification driving growth within the enterprise. “You can imagine what that did for our team,” Reilly said. Having engaged and committed workers and higher-up support is key, but staying abreast of new technology and innovation in the market is another. To help find those young startups that could be a benefit to the bank, for the last seven years Bank of America and Merrill Lynch have run a Silicon Valley Technology Innovation Summit. Hundreds of startups apply each year to attend. BoA invites a couple of dozen. On average, the bank ends up engaging with 17% of the startups who pitch at the conference. If there’s one thing Reilly wishes he had known before he started this process – one lesson he could impart on enterprises who want to go on this journey themselves -it’s to not underestimate the cost of legacy systems. It was essential for BoA to scale down the costs of the existing, legacy system (called the brownfield) as that new, greenfield environment was being spun up. If you don’t cut brownfield costs as you’re investing in the greenfield, then you’ll just be adding cost.